On misremembering a scene from Yaadon ki Baaraat, and the tragic fate of the 1970s Bollywood child actor - here's my new Persistence of Vision column for Yahoo India. The human mind is a worryingly unreliable thing. 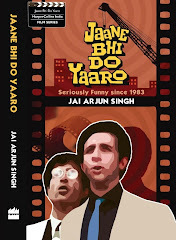 For years, I had the most vivid memory of an early scene from the 1973 film Yaadon ki Baaraat. Boy steals something from a shop, escapes pursuers, leaps off a bridge onto a train chugging below. When his feet hit the top of the coach, he is all grown up. Better yet, he is Dharmendra. In a Bollywood quiz conducted by Satan, with my soul at stake, I would have sworn that this was exactly what happened. But it turns out my reptile brain was giving me the goli all this time. The other day I saw bits of the film again on TV and the scene was very different from what I'd remembered. The boy, having (naturally) been separated from his siblings, is leaning on the bridge, staring into the distance. The camera now begins a complicated movement: first it pans down to his legs and feet, and then, without cutting, it swivels through 360 degrees (in the process giving us a glimpse of a train moving slowly nearby). When it returns to its starting point, the shorts-clad legs have been replaced by dark blue trousers. The camera moves up to reveal the gloom-stricken mien of Dharam paaji. And he doesn't even jump off the bridge! Not in this scene anyway. Actually, as Bollywood representations of children morphing into adults go, this is quite a complex and artistic sequence - better crafted than all those standard-issue shots of a boy's running legs dissolving into the man's. One might even call it cinematically ambitious. After all, a dissolve or a cut is the accepted way of marking a shift in time; movies use these techniques all the time. 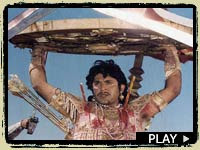 For example, a little later in Yaadon ki Baaraat, a scene where another boy runs behind a train, losing the race as it enters a tunnel, segues into a shot of the grown-up version of the character riding his bike out of a similar tunnel (except that he now has Zeenat Aman driving a very stylish car - or is it a small plane? - behind him, honking impatiently as the spoilt rich girls of 1970s Hindi cinema are wont to do). Now that's what I'd call a conventional time-shift scene (by Hindi-movie standards). But when 20 years rush by within the span of a single, unbroken shot, it really makes you sit up and take notice. Watching the 360-degree shot on the bridge also made me wonder about the fate of the kid playing the young Dharmendra. Imagine being the focal point of the action at the beginning of a shot and being completely forgotten by the time the shot ends. One of the crew-members probably yanked him away as soon as his feet were out of the camera's line of vision, so that the real star could come and stand in the exact same place. But then, such was the lot of child actors in those days - there was little or no appreciation for their very presence, much less their thespian skills. And being an avid watcher of those movies, I plead guilty: as a child I often fantasised about being Amitabh Bachchan but never, not once, did I fantasise about being Master Mayur. You remember Master Mayur. For most Hindi film buffs he is frozen in time as the sad-faced, snot-nosed urchin with ridiculous sideburns, holding a piece of stolen bread in his hand and wishing desperately that he were all grown up already so he could brood like Amitabh, wear a leather jacket and sing in Kishore Kumar's voice. Mayur played the young Amitabh in a number of films, and the first requirement for such a role was to swallow all your self-esteem and to learn to move and speak like a member of the Keystone Kops, the slapstick-comedy policemen from Hollywood's earliest years. During Amitabh's superstar phase, the first 10-15 minutes of many of his films played on fast-forward, as if the projectionist was screening at thirty-six frames a second instead of the customary twenty-four. This was because most of the stories were founded on an obligatory tragic childhood incident, which formed a necessary but low-investment "prologue". (Often the opening credits would appear only after this was over.) Watching these scenes today, one gets the impression that the child actors were asked to speed things up - to say the dialogue as fast as possible and walk hurriedly - so that the establishing sequences could be got out of the way and the superstar could come on. I can just picture directors prodding Master Mayur or Master Raju from off-camera: "Arre, lines jaldi bol, audience Amitabh ko dekhne aa rahi hai, tujhe nahin". In one of my favourite 1970s films Muqaddar ka Sikandar, there's a scene where the intrepid orphan played by Mayur fights a thief (his own age) and recovers a woman's purse. Being grateful, kind-hearted and Nirupa Roy, the woman expresses a wish to be the mother he never had. "Beta, ab se main tumhari maa hoon," she says quickly. "Sach, ma? Tum bahut achi ho, ma," says Master Mayur, speaking his lines just as fast, glancing about nervously for the director's cattle prod. Tears flow at double-speed, like the Rishikesh rapids in spate. Arm in arm, they scuttle away in the jerky Kops style. The whole sequence - including the fight scene and the establishment of a key, sentimental relationship - has taken up less than two minutes of screen time. And shortly afterwards, Amitabh makes his first appearance on a motorbike, singing the film's title song. "Rote huay aate hain sab," he croons, "Hansta hua jo jaayega, Woh Muqaddar ka Sikandar, Jaaneman kehlaayega." Translation: "Child actors come wailing into the studios. But the adult stars who laugh heartily, they will be the kings of their own destiny." Or something like that. However, I'm happy to report that the tale of the perpetually stricken Master Mayur had a short but pleasing sequel: more than a decade after Muqaddar ka Sikandar, he played the valiant Abhimanyu in B R Chopra's TV serial of the Mahabharat. If the show had been made 10 years earlier, Mayur would have been a shoo-in for the little Arjuna, telling his guru (in speeded-up sound) that he could see only the eye of the wooden bird. But as things turned out, he got to sport a moustache and be an (almost) adult hero in the Kurukshetra war's most intense battle sequence. Playing one of the most luminous cameo roles in all of ancient literature, Mayur had, much like his character, entered the inner circle at last. He went out in style, holding his own - at least briefly - against grown men. I thought he was badly miscast as the teenaged Abhimanyu. He seemed old enough to be Arjuna's younger brother. One of the most inspired castings of an adolescent hero-in-waiting is Frankie Burke in Angels with Dirty Faces. He looks so much like Jimmy Cagney that it is almost tempting to believe that the film was shot over a period of 10 years to let Cagney grow up sufficiently to play the hero. Ohh, I used to like Master Mayur when I was a girl. Strangely, I remember the 'Yaadon ki baaraat' scene in the same way you used to before. on an unrelated note to this post,was wondering of your take on 'udaan'..
You remember Master Alankar from Deewar? Brilliant expressions. after reading your post, even I was curious as to what is he doing now. Kaa: I know, I'd linked to that website in my piece - in the first reference to Mayur. Nice "kahaan gaye woh log" kinda piece. And even though I wasn't particularly impressed with or interested in Mayur, it's good to see that he's... well, come of age rather nicely.